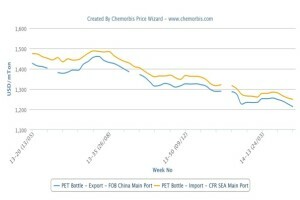 In Asia, export PET prices had seen year-low levels at the end of February in China and Southeast Asia as per the pricing service of ChemOrbis. Since then, prices had started to record gradual increases as they moved up slowly by around $30/ton until the second week of April, when they once again started to follow a decreasing trend. Nowadays, prices are $15/ton below even the lowest prices reported in late February. Despite the fact that the high season for PET applications is just around the corner, global demand is still muted for this polymer. Plus, upstream costs are not supportive and players report a significant oversupply for Chinese PET. Looking at the spot costs, Asian PTA prices retreated by $15/ton and MEG lost $20/ton on a week over week basis. In China, lower upstream costs caused buyers to be hesitant when making fresh purchases as they are waiting to see further declines in the days ahead. In the upstream markets, China’s Shenghong Group is planning to launch its new PTA plant at the end of May. The plant has 1.5 million tons/year PTA capacity. China’s Jiangsu Sanfanxiang is also planning to launch a new PTA plant in Jiangsu in September 2014. This new PTA plant will, too, have a production capacity of 1.5 million tons/year. In Southeast Asia, the market panorama is similar. In Malaysia, a source at a local producer commented, “Regional demand is quite good, but prices are still facing downward pressure from competitively-priced Chinese origins.” A converter confirmed the producer’s comments as they purchased some competitive locally held Chinese PET. 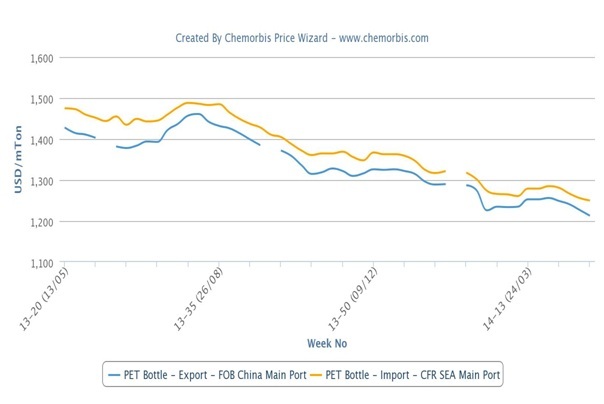 The converter reports seeing good end demand, but nevertheless, he expects further declines in prices in the days ahead given the competitive Chinese PET prices and the restart of some PTA plants, which will keep feedstock supplies ample.